I became a fan of Kristin Hannah's novels after reading "Firefly Lane." I quickly devoured a few more of her novels and couldn't get enough. My shelves are still filled with books of hers that I still need to read (between all the other reviews I'm doing). So when I received an opportunity from AuthorsOnTheWeb to read and review her latest, "Night Road," before it even hit the shelves, I was ecstatic! And this novel lived up to the hype surrounding its arrival in stores this spring. Jude Farraday has her hands full as the mother of twin teenagers who are getting ready to go off to college. She doesn't count on their tight connection with Lexi, a girl with a dark history of parental neglect, to affect their behavior and decisions. However, in the course of one night, a tragic event leads to the unraveling of the lives of Jude and Lexi. They both struggle to find the strength to get back to who they used to be before things came undone for them. 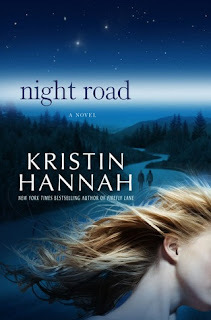 With "Night Road," Ms. Hannah has written a powerful and intense story that will stay with readers for a long time to come. It was challenging to read as a mother, but definitely worthwhile. It had elements of her own style, but gave off a Jodi Picoult feel that was also apparent in "True Colors." I found it impossible to put down, despite the difficult and heart-wrenching nature of the topic at hand. This is the second novel that has brought me to tears in the short time of a week (after reading "Skipping a Beat"). The characters really grabbed at me and I didn't know to whom I should be more sympathetic. The only criticism I have is with some of the dialogue. It seemed a bit forced and sappy at times. I know the story was meant to be a tearjerker, but I felt like people were just saying things to pull at the heartstrings instead of sounding natural. It almost had a Hallmark appeal in that way. I even felt like the teenagers sounded more melodramatic than usual. Of course, I haven't spent much time around teenagers lately so maybe they do sound that way these days. (Parents of teenagers, if you read this novel and disagree, please clue me in.) This didn't keep me from liking the novel as much as I did, so it definitely was not a deal breaker. Special thanks go to Wiley Saichek from AuthorsOnTheWeb for this review copy. Excellent, poignant story of love, grief, and hope!!! Truly wonderful snapshot of a family who has lost a loved one and overcome the hopelessness that grief can leave.